During the summer five years ago, for a last hurrah before starting med school, I opted for a cross-country road trip. From Richmond, Virginia I beelined across the country to Rocky Mountain National Park as my first stop. 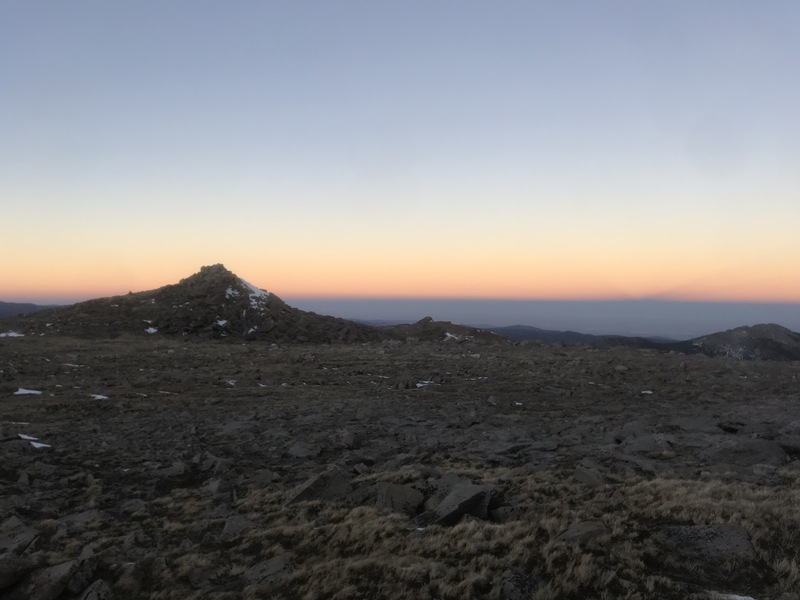 When I caught my first glimpse of the beautiful craggy summit of Longs Peak, I knew I wanted to hit up the class 3 scramble route to get to the summit. After years of living on the East Coast with mountains no bigger than the foothills at the base of the Rockies, I was hooked at first sight. 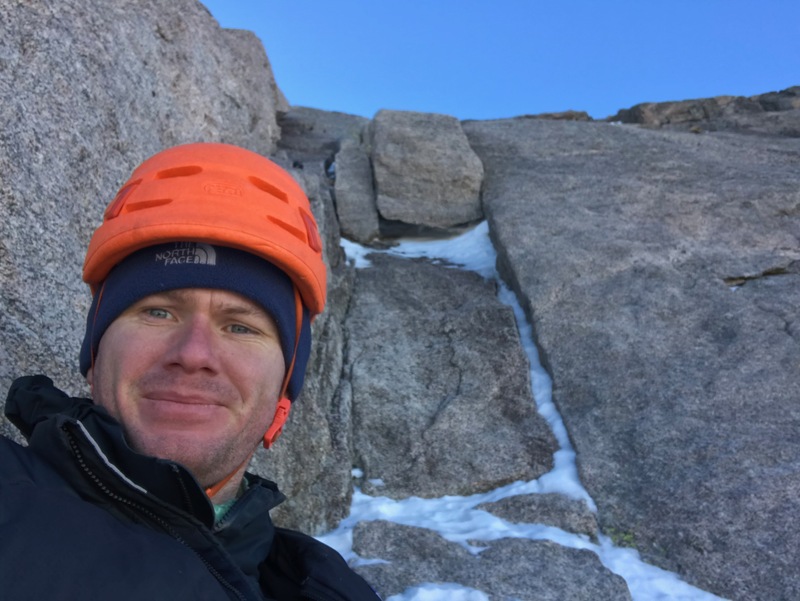 A few days of acclimatizing got me to the Boulderfield, the campsite at 12,700 feet elevation at the start of the scramble part of the Keyhole Route to the summit of Longs. While eating dinner and chatting with another camper, we saw two guys rappel down another route on an imposing face and come strolling through the campsite. I asked them how they got into that and got the scoop. Step one: join the local gym. Beyond that everything else would fall in place. It seemed like an arduous process for someone who was used to being rapidly self-taught. But as I’ve learned, mountaineering is no joke and definitely takes time to get down. So five years later I found myself at the Boulderfield again, but this time with no climbing partner, in the winter, and with a bolder objective. 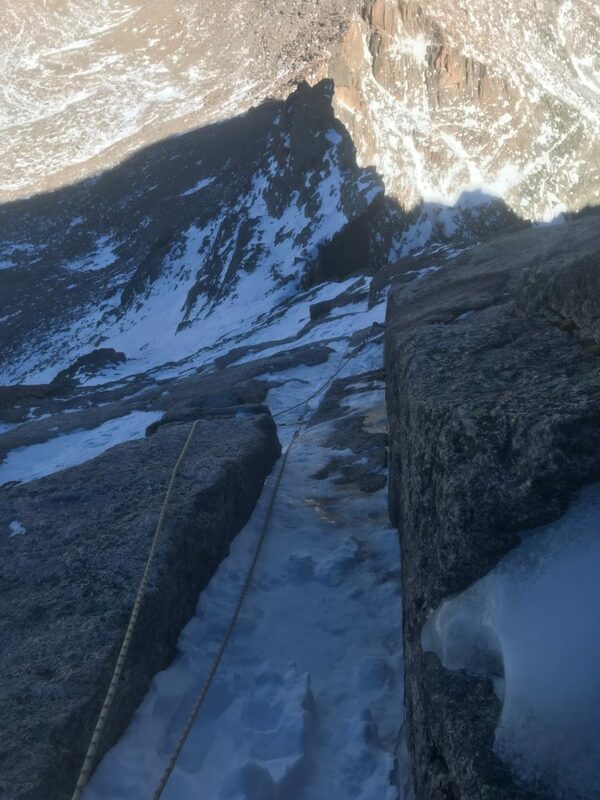 I had the Longs Peak winter Cables Route ascent in mind, a more direct but more technical route involving two pitches of 5.4 climbing to attack the summit block. 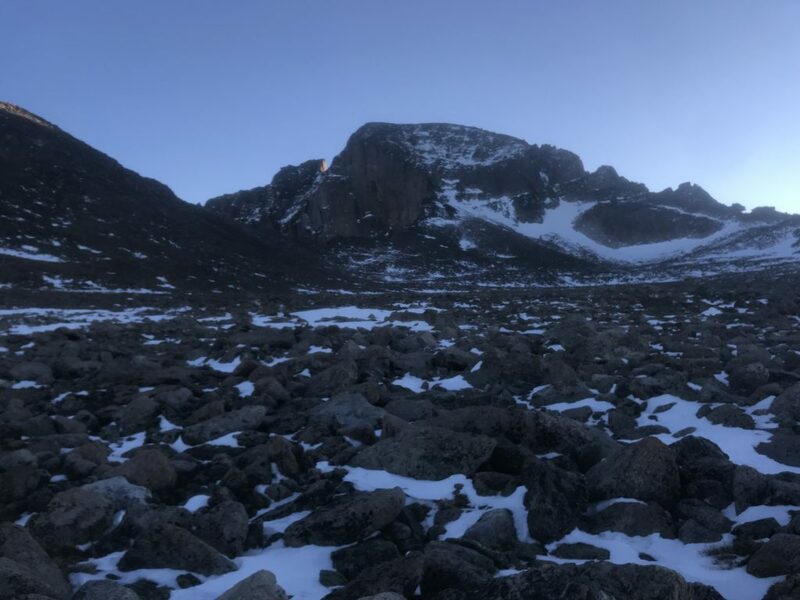 I had spent days acclimatizing to the altitude, temperatures, and wind, and scoping out the route to see if it was even feasible. 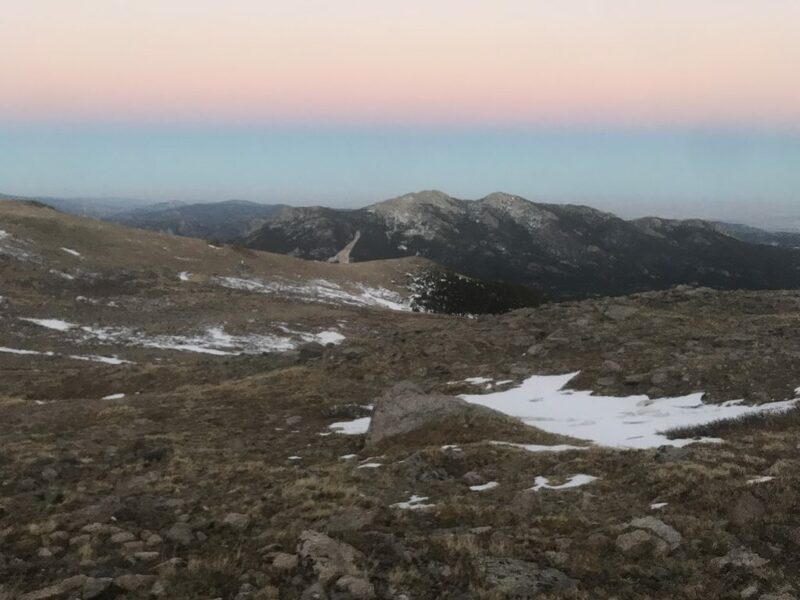 I cached my tent up near the Boulderfield on one of my acclimatization runs but found the pass just one and a half miles down from the campsite completely impassable due to winds gusting over eighty miles-per-hour. I crawled along the ground on all fours trying to see if the wind would let up out of the natural notch formed by the ridge but ended up turning around and stumbling down to safer terrain. But as the week went on, the weather window opened and unlike many teases from early forecasts, it slowly improved as the day came. Highs of up to 16 degrees on the summit and winds less than 15mph for 48 hours and less than five for Friday morning with clear sunny skies. 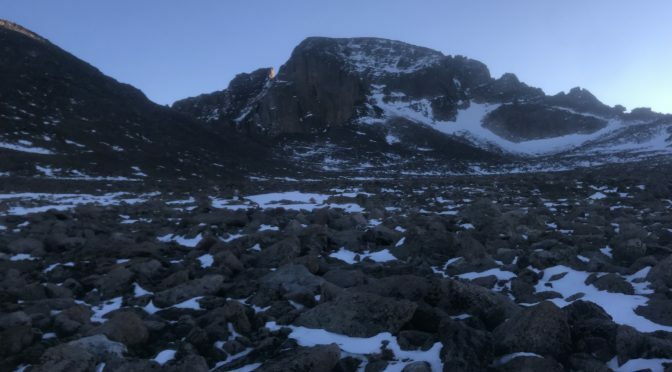 On Wednesday night I established an itinerary for the Longs Peak winter ascent with a couple people back home and packed for the following day. 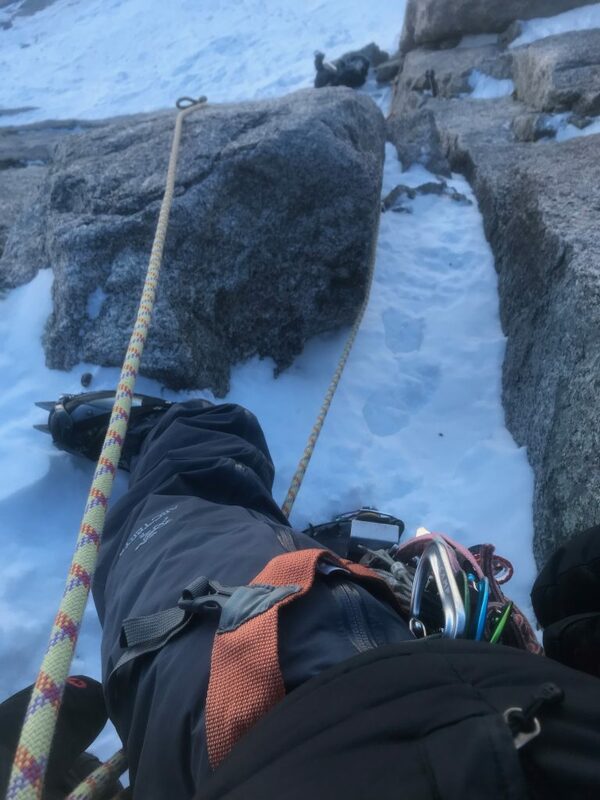 I whittled down my rock rack to the bare minimum that I thought I would need, cut my rope from seventy meters down to fifty, and ditched anything that was not necessary for my safety up on the mountain. Thursday morning I began the exhausting approach up to the Boulderfield and had the hike to myself all day. I set up camp in calm, warm conditions and began the arduous process of melting two liters of snow and cooking dinner. I laid down in my sleeping bag early to keep warm but around 7pm heard voices coming from up on the mountain. I opened my tent door and was elated to see two headlights descending the route I would attempt in the morning. I knew that this meant I would have a boot track to follow up there and that the rappel anchors would be reasonable enough to locate underneath the snow. I spent the early morning on Friday melting snow and contemplating the ascent. I knew that with a rack and a rope that at any point I would be able to bail but it still felt overwhelming to be up there alone. I felt great and had no reason to not have a go other than my own self-doubt. Everything felt too perfect, like at any point it was all going to come crashing down. 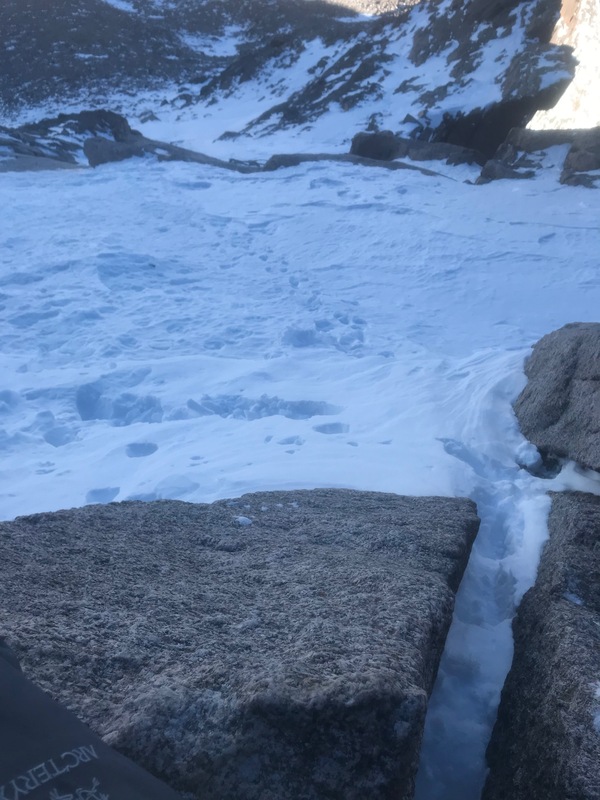 Another person worked his way up through the Boulderfield and headed for the Longs Peak winter Keyhole. I decided I would at least ascend to the snowfield at the base of the two technical pitches and then decide whether to proceed or abort. 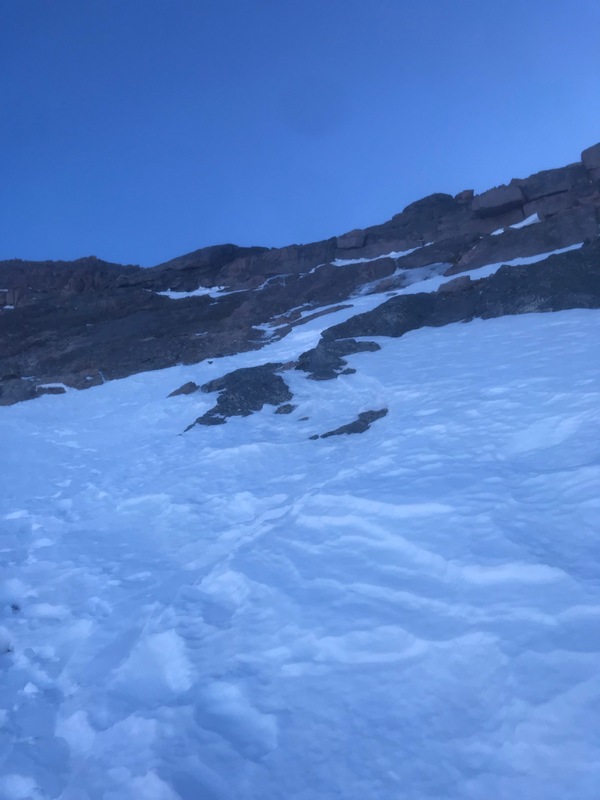 I slowly worked my way up to the bat shaped snowfield at the start of the route, navigating my way through the steep snowfield, staying on lower angle terrain as best I could. The snow was firm and took crampons well which bode well for the snow present on the two pitches ahead. When I reached the base, the snowfield was too steep to sit and rack up so I had to climb the initial few feet of the pitch to reach a ledge. Snow and verglas was minimal but helpful in spots. The route had firm snow in every crack up the wall but not too deep to prevent rock protection from keeping the route safe. I made another small goal of getting to the the top of the two pitches, knowing it would be easy to bail if I felt uncomfortable at any point. I built a bomber anchor and began to rope solo the first pitch, sewing it up with pro as I went. Next, I built an anchor about two thirds of the way up the technical stretch, tied off a fixed line, rapped down and cleaned the gear, and then ascended the fixed line back up to my anchor. I climbed the last pitch with ease, not knowing whether the snow made the pitches easier or harder. With infinite footholds to front point into with my crampons it felt like cruiser climbing. At the top of the second pitch I repeated the process, building an anchor, rapping and cleaning, and ascending back up. The arduous process of rope soloing requires the route be climbed, cleaned, and then ascended. Snow made the climbing easy. Above the technical pitches with no hiccups so far and a beautiful, sunny, windless day, I felt no reason to not have a go at the class 3 scrambling to the summit. 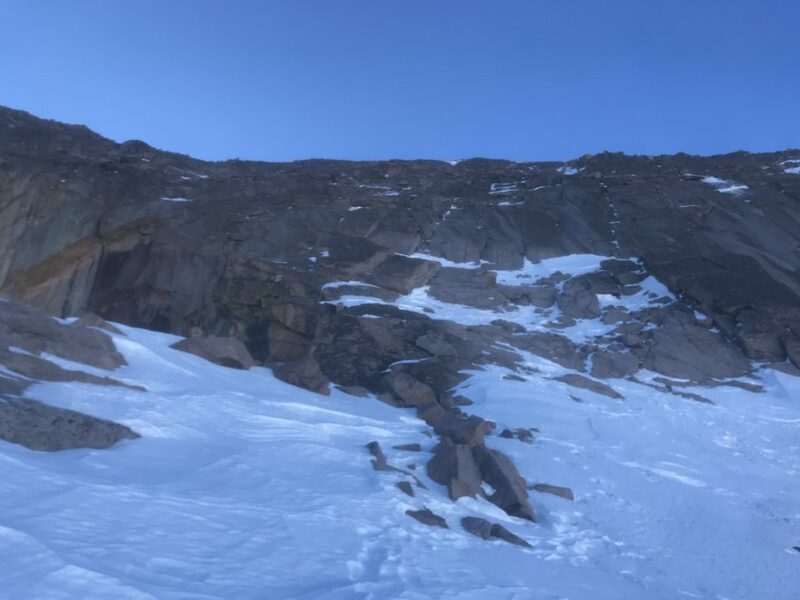 I crossed a couple of precarious appearing but gentle grade snowfields to easy class 3 scrambling with minimal difficulty route finding due to the cairns. The footprints from the people the night before led me too high into class 4 scrambling but it was easy to stay low and find to route again. It was intimidating knowing the diamond, the thousand foot vertical rock face, lie directly below me but with the easy scrambling and solid rocks, a fall didn’t feel as likely or as dangerous as it does on the Keyhole route. And at any rate, if I needed to rope up to feel safe, I had a rack and rope to assist me. The snowfield traverse above the diamond. After a short time scrambling, I scurried up to the summit in beautiful, warm, windless sunshine. I could have had a picnic up there but I knew it was best to get back down and celebrate at the car. 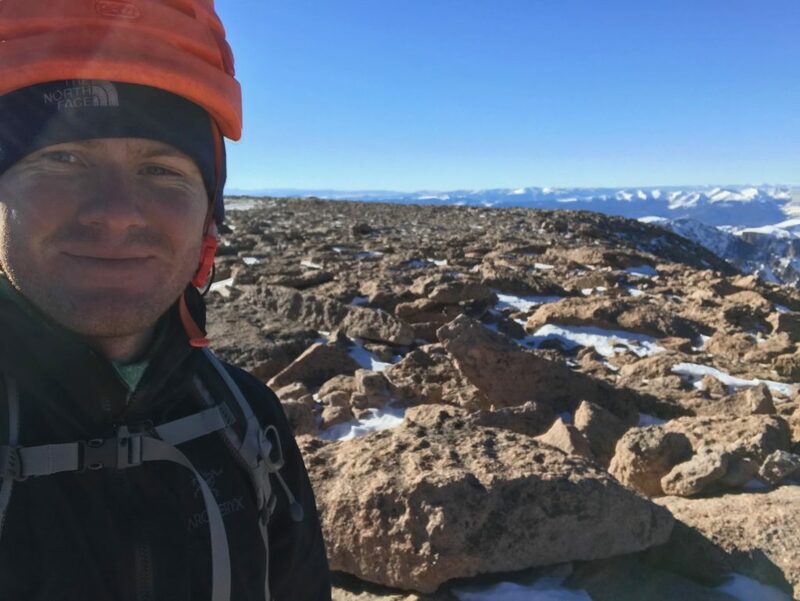 I spent just a few minutes on the summit, warming up in the sun and refueling before beginning the descent and the two rappels to get back down to the snowfield. The descent flew by in less than a third the time it took to reach the summit. The raps were easy and then the descent down the snowfields felt less ominous than it had on the way up. Back at camp I quickly packed up my tent and with a tremendous pack, began the hike back down to the Longs Peak trailhead. With the whole trail to myself once again, despite the gorgeous winter day, I cruised down in bliss. The winds were still calm and temps warm and I stripped down to a t-shirt by the time I reached treeline. Happy to reach the summit but not content yet. 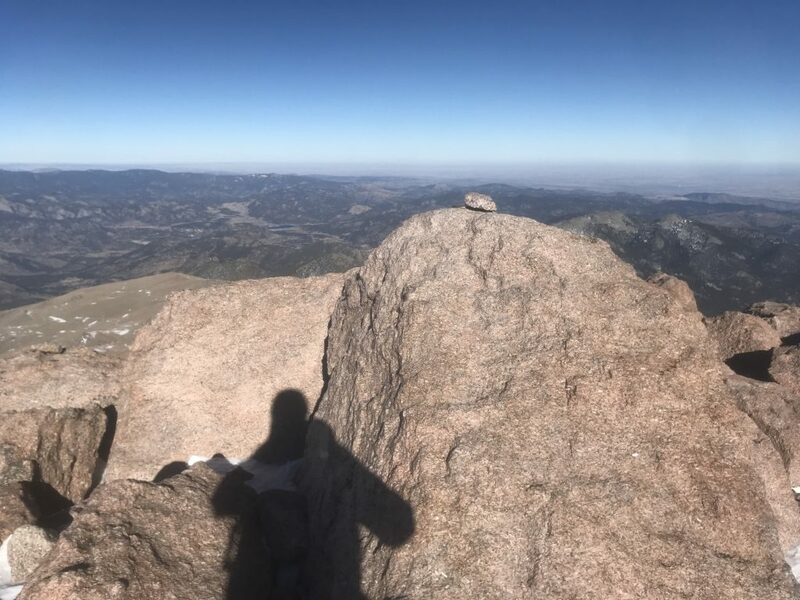 I hesitate to call this a true Longs Peak winter summit just because of the absolute gorgeous weather window I had but by the calendar it is one of the biggest accomplishments of my life. Recounting the day to one of my friends I retracted my statement that it was epic. I had planned and prepared for the trip unknowingly for five years since that day I saw those guys on the mountain. And having climbing partner after climbing partner bail on me taught me the essential skill of rope soloing for safely travelling independently in the mountains. For months I had been planning the best route to the summit and studying the weather to know exactly what it would take to get up there. And I completely lucked out with the conditions. It was anything but epic. If anything, the whole two days was an absolute bore. As much as I try to avoid the type two fun exhaustion and danger in the mountains, I won’t pretend that I’m not okay when it rolls around. 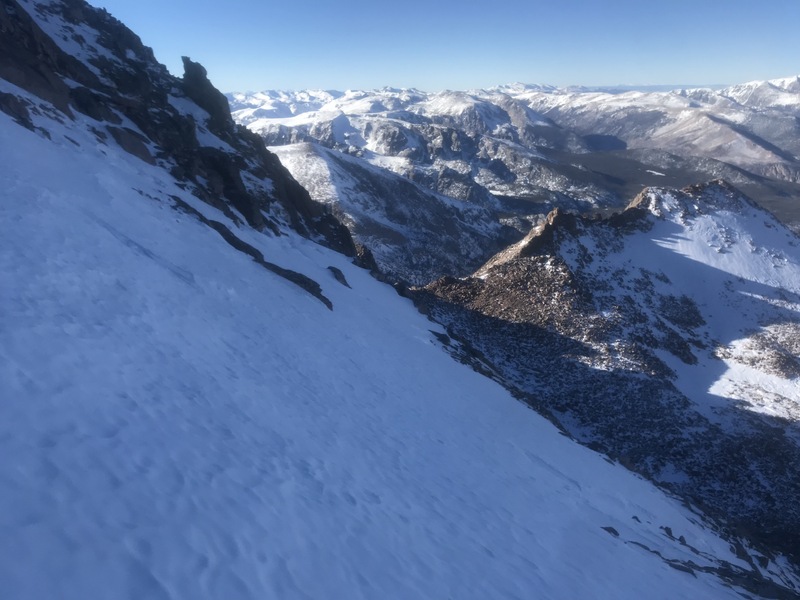 This Longs Peak winter ascent, however, was anything but. It can hardly even be called an adventure. It was a well-calculated and well-executed climb without a single hiccup. It’s nice to know I can do that when there is minimal room for mistakes but it’ll be fun to return with a partner for some true epics in the not too distant future. Sunset from Granite Pass. The shadow of Longs can be seen as an inverted V on the right. Beautiful sunset to finish the day. 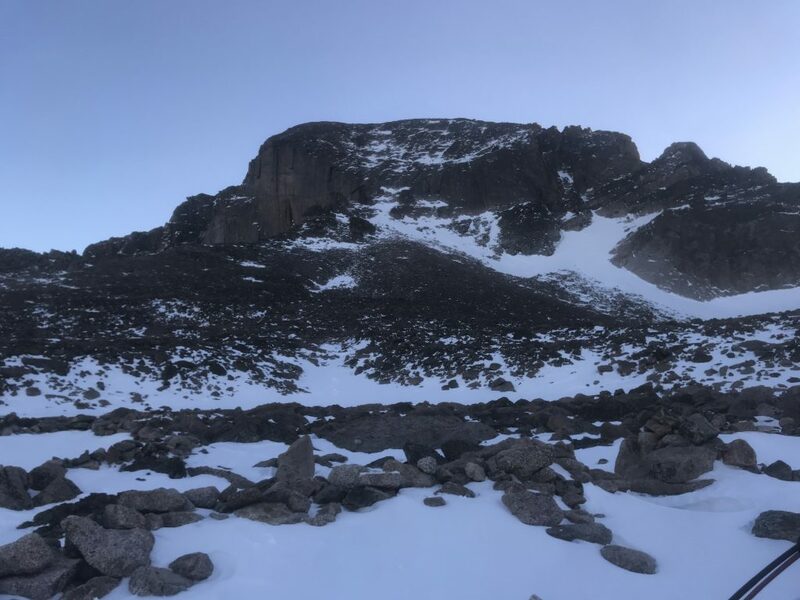 After failed summit attempt after failed summit attempt for over two years it was nice to get a proper climb in with a Longs Peak winter ascent. I dealt with flak from a couple people in the days following the summit and I’m sure I’ll get more after publishing this post. But my own self-doubt and comfort with turning around almost cost me a summit on an idyllic day. The fact that no one else was up there that day was a downright shame. Being an out-of-towner I’ll eternally be seen as a gumby in the mountains by the locals. But when it comes down to it, on the most beautiful day of winter, no Coloradans were up there and I have no shame in appreciating the mountains in the best way I know how.